The Irish have given English its heart, wit and a pleasant-to-the-ear lilt. They have a smart and soulful way with the English language, which is celebrated, in part, by the annual reading of James Joyce’s masterwork, Ulysses. 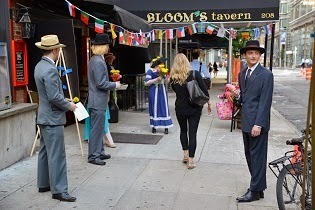 What better place to honor Bloomsday than at Bloom’s Tavern, one of several New York hang-outs for Joyce’s (or is Harold Bloom’s) big day? The 2016 Bloomsday celebration was also the centenniel of Irish independency. “Origin’s 3rd Bloom… @ Bloom’s Tavern of Course!” is organized by Origin Theatre Company. There was music by the Irish-folk-rock troubadour Alan Gogarty; actors in costume greeted visitors for a feast of an Irish breakfast. As is the custom on Bloomsday, actors recreate the summer morning chronicled by James Joyce in Ulysses set in Dublin on June 16, 112 years ago. Reading from the magnum opus were, among others, Fionnula Flanagan, Malachy McCourt, Alfie McCourt, author Colin Broderick and actors Terry Donnolly, Patrick Fitzgerald, Brenda Meaney, and Fiona Walsh. Also on hand for the festivities was David Staller, champion of all things Shavian, and Charlotte Moore, doyenne of the Irish Rep. Jonathan Brielle, author, composer and lyricist of Himself and Nora introduced the musical through songs performed by its stars, Matt Bogart and Whitney Bashor. Joyce coined the idea of Bloomsday, himself, inaugurating the event on June 16, 1924. The cast and presenters at the 2016 “Origin’s 3rd Bloom…” carried the tradition of the day forward with reverence and humor. 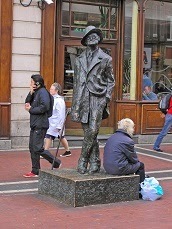 You may be interested in hearing what we’ve said about past Bloomsday celebrations as well: http://wp.me/p5jq0w-3C. Read The New Yorker‘s analysis of what is or is no longer shocking about Joyce’s shocking book.